A call to Dbeere Yachts confirms a £600,000 price drop on the 28.14m motor yacht Kitaro, a joint listing with Debbie Beere and Nigel Bristow at Sunseeker Monaco. A Sunseeker Predator 92, she was built in 2009 to a design by Don Shead and accommodates eight guests in a master suite, VIP stateroom and two twin cabins. Twin 2,434hp MTU engines linked to surface drives give Kitaro a top speed of 38 knots. 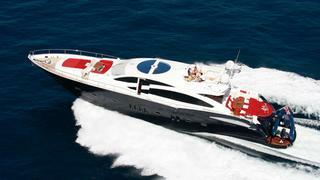 Lying in Mallorca, Kitaro is down from £3,595,000 to £2,995,000, VAT paid.